MoneySense.ca, “Canada’s top personal finance magazine,” has posted a list of the “Best Places to Live” in Canada, ranking 209 cities and towns on a 103-point scale. Top marks for 2015 go to Boucherville, Quebec, a south-shore suburb of Montreal, while New Glasgow in Nova Scotia comes last, making it either the 209th-Best or the Worst Place to Live in Canada. 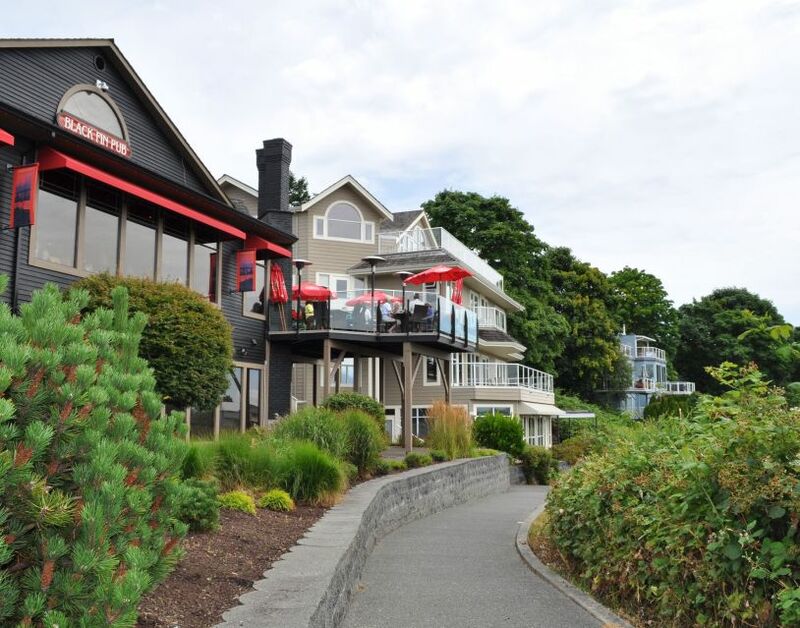 The District of North Vancouver is British Columbia’s top-ranking municipality, in ninth place nationally. Port Alberni, a Vancouver Island town that I would personally rate as Not Too Bad, sits at 207. The MoneySense website provides a fair description of the 34 categories of data used in the scoring. Reporter Mark Brown writes that housing costs, “healthy population growth” (presumably to show that people are not fleeing the area) and unemployment levels are the most heavily-weighted categories. Unfortunately, while some of the collected data is provided in the interactive ranking table, its significance in the development of the index scores is not shown, and neither are the final index scores for each city. As a result, the logic of the best-to-worst ranking is unclear, at least to me. The Metro Vancouver municipality of Richmond, for example, has desirable real estate, rapid transit, and proximity to big-city services, but it has landed in 63rd place, far behind less affluent and less accessible Port Coquitlam. Surrey comes in at number 141, despite having some desirable neighbourhoods (albeit in automobile-dependent zones.) Friends who live in Delta (13th place) suggested that the rankings may indicate towns where there’s “a sense of community.” But Delta itself has at least three distinct communities, separated by stretches of highway. And it’s a certainty that some of the smaller towns near the bottom of the rankings have a strong sense of community. In the table of Lower Mainland municipalities below, as ranked by MoneySense, I’ve thrown in Brandon, Manitoba, a small, remote city with harsh winters (26 of 209), just to mix things up. The table also shows Comox (25) and Courtenay (129), two Vancouver Island towns that are immediate neighbours. The crime index is generally lower in places that do well in the rankings, which should be no surprise. 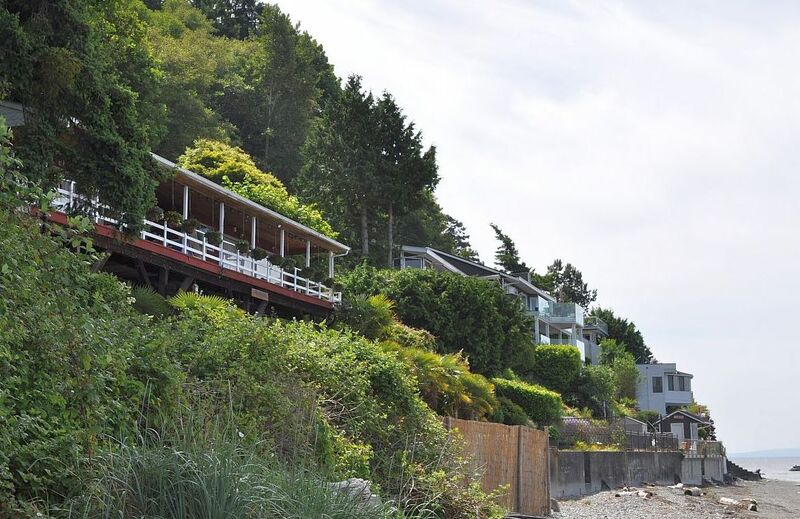 The property tax trends, however, are inconclusive, and are muddled further by their arrangement on a per-person basis, so that cities with high numbers of renters (Vancouver, City of North Van) are seen to enjoy abnormally low taxes. The presence or non-presence of rental housing also seems to be a non-factor. 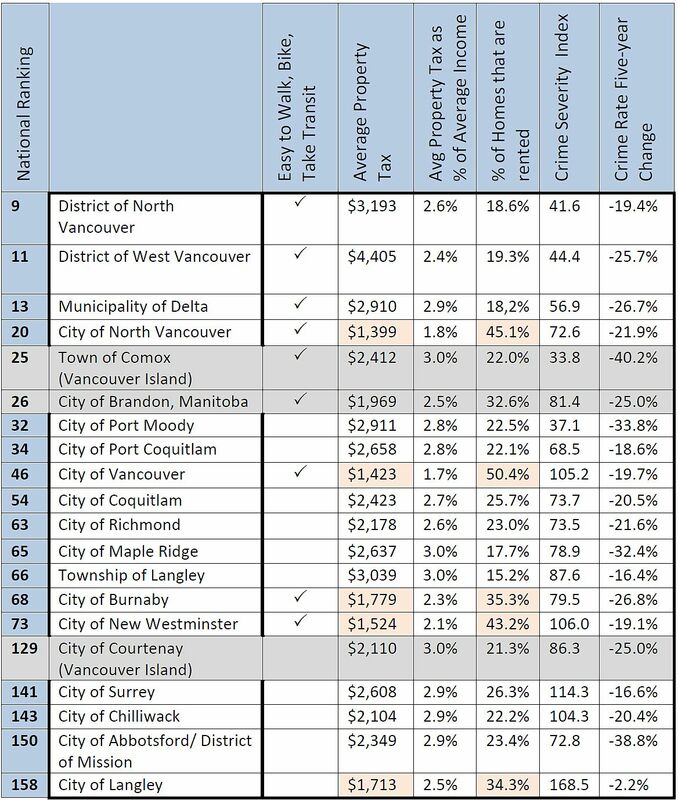 The better cities are more likely to report easy walking and transit, although I don’t actually believe the District of North Van is above average in this regard, and Delta, as mentioned above, is dominated by highways outside of its separated villages. Going back to the original Money sense table, there’s no town in B.C. that places in the top 25 per cent of Canadian cities for good weather (think Ottawa, or Medicine Hat). And only Terrace, B.C. (ranked 122 overall) and Quesnel (193) were measured in Canada’s top 25 per cent for affordable housing. Here are the 2015 MoneySense rankings for “Best Places to Live” in Metro Vancouver and the Fraser Valley: The index system on the website you’re looking at, the Fraseropolis Urban Villages index, is more modest than the MoneySense product in considering only small walkable areas. It is also more transparent in how its scoring is assembled — although in the end, the scores on Fraseropolis are based more on visual clues than on hard data. why is Brandon, Manitoba in this list?? I don’t have anything against Brandon – my mother grew up just a few miles north – but for anyone interested in this data-derived list of Canada’s best places, it’s notable that the City of Vancouver rates below Brandon. I guess this just shows that different people have different priorities. Some Vancouverites would find Brandon unbearable, and vice-versa.